The truest lovers of pizza craft their own from scratch and will most likely never reach for the frozen bricks in disguise. My husband and I are die-hard, gourmet pizza eaters. When he's not trying new beers and I'm not eating dessert, we're eating pizza. Our pizza crafting curiosity began in college when my roommate effortlessly threw the dough in the air like they do in movies, forming perfectly oblong pies, nonchalantly dealing out toppings like she was waving a magic wand. She'd produce these magnificent pies, and I wanted to be just like her! I tried to follow her direction, even attempted the cool hand toss thing, but I probably won't be doing that again. My pies turned out... rectangular? When I served my creation that I was half proud of to my now husband he chewed on the rubbery contraption, bug-eyed with a smile that said "thaaaaanks." Needless to say, I took a break from pizza-making until after college. 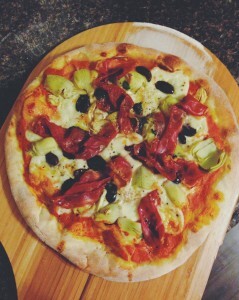 My husband and I started up again this past summer, hoping to relish in our homemade pizzas once and for all. We bought our dough, patted it out, lathered the sauce and toppings on, and lay it to cook on our fancy pizza stone. We thought we were set. The appearance was deceptive -- beautiful, with crispy arugula and prosciutto curled angelically, but the crust was moist, rubbery, and a sorry excuse for a pizza. The generous dollops of marinara probably didn't help its mushy demeanor, either. This past summer, my husband was employed as a pizza delivery guy. One night he came home with a look, maybe even a twinkle. "It's all about the stone!" He'd discovered our pizza stone needed to be heated prior to putting the pizza on its surface. Simply, baking a pizza on a stone is like searing a steak. You've got to let the stone get incredibly hot (about 450 degrees F) before placing the pizza on top of it so that the dough can form a dangerously crispy crust. We used to toss the pie, place it on the stone at room temperature, then put the whole shebang in the oven. In doing this we were essentially slow-cooking the dough, which is what lead to the rubbery texture. The trick is to let the stone sit in the stove as its preheating, then wait at least 15 minutes before placing the pie in the oven. Amidst all of the change-ups, it was ultimately about the precious stone temperature. After gathering our newfound pizza knowledge, we made all the necessary tweaks to perfect our dream pizza. What came out was a beautifully crusted pie. It was round. It was well-sauced. It was better than the quintessential pizza we'd eaten in gourmet Italian restaurants. Do let me know if you have any other pizza tricks you'd like to share!